Shocking Pink was a magazine by and for teenagers and young women. Spanning 1979 to 1992, the magazine’s history charts a tumultuous period in British history and politics, not to mention feminism. Not quite a magazine, but not really a fanzine, Shocking Pink occupied a unique position in the post-punk second wave feminist world. It had access to and support from organisations and service that are now extinct and, in a pre-internet world, where sales were done face to face, by mail order, or through left wing bookshops, it was able to fill a distinct niche for a range of disaffected young women as well as gain recognition from the mass media. It was run by three different collectives throughout its long history and, while this is not a comprehensive study and I have only spoken to a small group of women who were involved in the magazine, I do hope to provide you with a behind the scenes history of the magazine throughout its three phases, and to set that history in the wider feminist, historical and political context of the 1980s and early 1990s. I will also be exploring the magazine’s legacy. Talk of launching a feminist magazine for young women, by young women, started at a young women’s feminist conference in 1979. As a result of this conference, an advert was placed in the women’s liberation magazine Spare Rib, which was read by the then 18-year-old Miranda*, at the time working at a record company in London. Fresh from performing in a number of bands, Miranda was interested in the music business, but was also discovering the rampant sexism of the industry. She saw the advert in Spare Rib as an opportunity to “get involved in something and meet some other like minded young women”. Sally, who had also been working as a gofer for The Slits while on the magazine. explains: “I’d got burnt out and I honestly did feel I was too old.” She was 22. When Shocking Pink, ended, money was left in the magazine’s bank account with the specific intention of handing it over at a later date to another magazine for young women. A few years later, two sets of young women had independent but roughly coinciding desires to launch such a magazine. As with the previous incarnation of the magazine, Shocking Pink II was interested in “feminism, young women – things that mattered to young women – lesbianism, left wing issues” and Jo is careful to stress the importance of humour, “jokes, making things funny”. Shocking Pink campaigned fiercely against Section 28 of the 1988 Local Government Act, which sought to ban local councils from “intentionally promoting homosexuality” and forbade schools to promote homosexuality as an acceptable family relationship. The insertion of Clause 28 into the Local Government Bill occurred on 8 December, 1987 and, despite a series of protests that included invasions of the Lords and the BBC by lesbian protesters, lobbying by arts organisations and a march in Manchester that was attended by 13,000-20,000 people, the bill became law on 24 May, 1988. In a political climate in which hysteria over Aids was at its height and a media climate in which The Sun could get away with publishing a cartoon depicting a gay lynching, the Conservative Party saw an opportunity and the fate of the bill was seemingly sealed from the start. It wasn’t until 2000 that the Scottish Parliament repealed Section 28 and the rest of the UK had to wait until The Local Government Bill 2003 for it to be repealed. 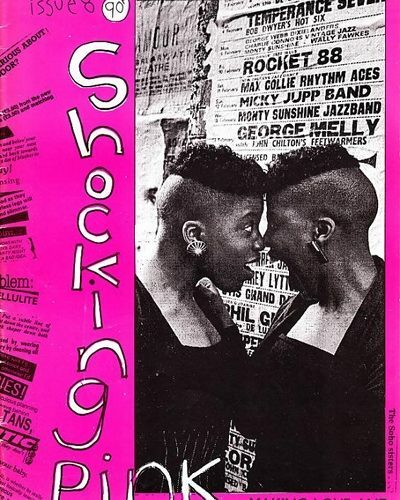 The question of how much to stress the lesbian aspect of the magazine had also been an issue for the first incarnation of Shocking Pink, which also featured lesbian content and had lesbians on the collective. Miranda explains that, while the collective was over 50% lesbian, it was decided that the magazine would be promoted as being for young women, not as a magazine for young lesbians. After three years at Shocking Pink, Jo Brew was ready to move on. “I felt I’d done everything I wanted to, and that I wasn’t that excited by it anymore,” she explains. In the immediate aftermath of Shocking Pink she worked at both Shelter and Spare Rib. Previously involved with the feminist magazine Outwrite, Katy Watson took Shocking Pink off the hands of the second collective in 1989. It was also around this time that the magazine moved to its final home, 121 Railton Road in Brixton, an infamous anarchist squat. As was the case with the second incarnation of Shocking Pink, the magazine was sold on demos, in lesbian pubs and even “outside Brixton tube station, just like the SWP would with their paper”. One of the political demos the Shocking Pink collective attended was the Poll Tax demo in London on 31 March 1990. The climax of anti-Poll Tax demos across the country, the march began in Kennington Park in South London and ended in Trafalgar Square. Attendance was so huge that the front of the march had already reached Trafalgar Square by the time the last person had left Kennington Park. A decision by police to first of all divert most of the march away from Downing Street, where about 2,000 people had broken away from the march and were being contained by police, and later to move this contingent to Trafalgar Square in the hope that the largely peaceful crowd there would absorb this troublesome minority, backfired spectacularly. What happened next has become known as the Poll Tax Riots, during which riot vans drove into crowds of protesters, materials from a building site – including scaffold poles – were hurled at police and mounted police charged protesters. When the crowd was dispersed from Trafalgar Square in the evening, trouble spread to the West End and led to a series of running battles between police and protesters. Windows were smashed, shops were looted and fires were lit. Katy estimated that “about half a million people” attended the demo and describes rioting in Trafalgar Square. “We were sitting by some landmark and I would say [to my sister] ‘I’ll see you in 10 minutes’ and I’d go and try to riot and chuck things into the crowd.” She added: “There were huge buildings in Trafalgar Square set on fire and it went on well into the night.” The day after the Poll Tax Riots, rioting broke out at Strangeways Prison in Manchester and continued for 25 days. By the autumn of 1992, riot grrrl had reached the UK from the US, and Katy was DJing in “a couple of gay punk clubs”. It was around this time that Shocking Pink was wound up for good and, as had happened with the first collective, the money left in the collective bank account was used to finance a new feminist magazine for young women or, in this case, two new magazines: Subversive Sister in Manchester and Katy’s new project, Bad Attitude, which launched in December 1992. Bad Attitude and Subversive Sister were not the only magazines to owe a debt to Shocking Pink. In 1991, Erica Smith started Girl Frenzy, initially a comic-based magazine by women, for women, based in London. Whereas Bad Attitude would disappear for lack of collective members around 1995, Girl Frenzy was still going strong in 2,000, launching its first annual, The Girl Frenzy Millennial. Both magazines would foreshadow and, after initial scepticism, embrace riot grrrl. Bad Attitude focused on international politics as well as feminism, and Girl Frenzy initially focused on women and comics, but both shared Shocking Pink’s combination of feminism and humour, and a variety of irreverence and anarchy that was hard to match or replicate. Louise Carolin has also pointed to the influence of Shocking Pink on “the new generation of commercial gay magazines” including Diva, where she is now assistant editor.